Schools were important to the valley’s early pioneers. Most of them had attended one room schools back east and, once their children began to grow, home schools were set up. Then the entire community pulled together and built a one room school house. Danville’s first grammar school was built south of Danville in 1858. After the Danville Grammar School District was established in 1865, a new grammar school was built on Front Street near the village center. “A social reunion is to be given at the new School House near Danville for the benefit of the building fund. The desks have not yet been placed on the floor and it offers a tempting invitation to dancers. Good music, good company and a good time may be anticipated. Unfortunately this school house burned down around 1870. The original 1858 building was then moved into town in 1871 and students were taught there for 25 years. Finally, in 1895 a $5000 bond issue was passed for a new school. 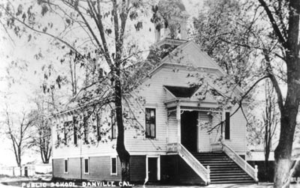 Danville residents proudly dedicated their new one room school in 1896; it was a classic building with a bell tower and large front steps. Teacher A. J. Young taught at both the old and new Danville schools from 1883 to 1900. He was a strict teacher and, as Presbyterian Sunday School Superintendent for 60 years, young Presbyterians from Danville saw a lot of him six days a week. The school, Danville Grange and Presbyterian Church were not far from one another on Front Street. An open space which was used for recess and for Grange harvest feasts framed these important community buildings. School was in session only five months a year since roads were impassable in winter and the older student were always needed to do farm work at other times of the year. By 1904, 80 students attended the school. When Hazel Arthur (Wiester) taught in 1911, there were 8 ½ grades with 64 children. By that time state law required two teachers for that number of students, so she taught grades 5-8 and Maryann Burell taught grades 1-4. There was no running water in the school. Hazel recalled there was an organ, a huge pot-bellied stove in the middle of the room and a good sized library. Another Danville Grammar School was built in 1922 on Love Lane. At a cost of $20,000, a new school with four rooms was constructed next to the high school, opening in January of 1923. Margaret Baldwin remembered carrying her books from the Front Street school to the new one when she was in fourth grade. That same year the old school building was torn down. Students from other one room schools came to Danville -- Green Valley in 1930, Sycamore in 1927 and Tassajara in 1946. Their daily attendance had dropped and parents thought the modern school offered other advantages. 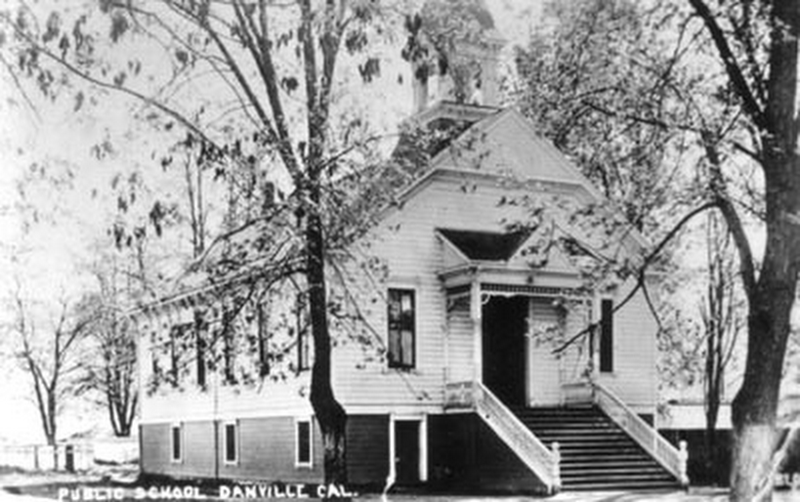 According to long-time teacher and principal Maevis Wood, when the Danville Union Grammar School was established, it spelled the end of one room school education in the San Ramon Valley. The Alamo and San Ramon voters debated joining the Union District but decided to keep their own grammar school districts and eventually built larger schools. After the four-room Danville school closed in 1958, students moved to the brand new Montair Elementary School and the old building was used as high school classrooms, a Community Center, a pre-school and a little theater. Today the high school’s Performing Arts Theatre is on that location. Sources: Contra Costa County Histories from 1882 and 1914; oral histories of Hazel Wiester and Maevis Wood; archives at the Contra Costa History Center and Museum of the San Ramon Valley. Photograph of 1896 dedication from the Museum.